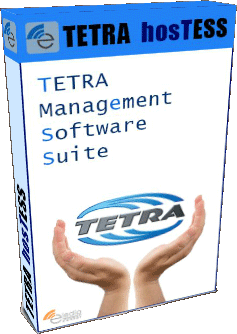 The TETRA hosTESS software platform exploits TETRA functionalities to enable advanced services for providers and end-users. Real-time Tracking, GPS logging and statistics, Remote-Terminals GPS Reconfiguration (LIP), Persistent Message Routing and Delivery, TETRA network monitoring and coverage estimation, scriptable actions and alerts triggered by Terminals events. ELEDIA TETRA hosTESS software can access to the TETRA network as client application through a standard TETRA Modem (ETSI) and as full-gateway when registered to the central Short Data Router (SDR). hosTESS is a software suite for TETRA Network and Terminals management. According to the European Telecommunications Standards Institute (ETSI), the TErrestrial Trunked RAdio (TETRA) is a digital trunked mobile radio standard developed to meet the needs of traditional Professional Mobile Radio (PMR) user organizations for their Mission Critical Communications. TETRA is the only wireless network that was approved in Schengen agreement to serve as public safety and security (PSS) network in Europe. TETRA is also used in other continents and not only by PSS users. TETRA hosTESS exploits potentialities of (ETSI) Location Information Protocol (LIP) to provide real-time tracking, notifications and persistence (GPS logging). TETRA hosTESS allows to dynamically reconfigure GPS triggers of Terminals through the (ETSI) Location Information Protocol (LIP). For example, it can change the time frequency of GPS location notification. 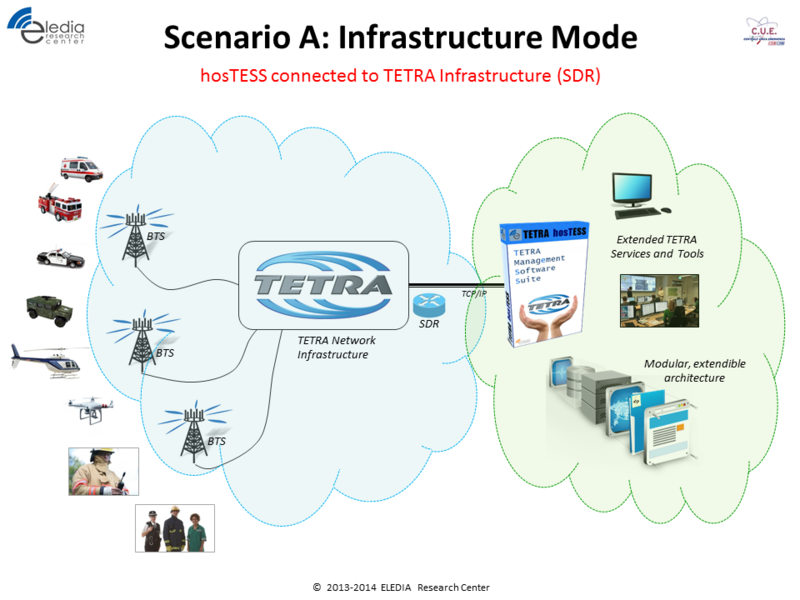 TETRA hosTESS supports Textual and User-Data (SDS) Messaging and provides persistent Routing and Delivery, logging, interoperability with other communication protocols such as email, SMS, Skype and more..
Real-time monitoring of TETRA network for anomaly detection and troubleshooting. The TETRA coverage map might be estimated from real data (i.e. RSSI) acquired transparently from terminals (i.e. crowd-sourcing). The integrated alert management system can monitor in real-time the activity of terminals for identifying particular patterns (i.e. communication problems, inconsistent location) in order to detect malfunctions and act as watchdog for personnel safety. The persistence and relay layer support the acquisition and retransmission of user data such as remote sensor stations and devices connected through TETRA Packet Data. Software runs on one infrastructure server, connected to the TETRA Short Data Router (SDR) through TCP/IP protocol. This work-mode enables all suite features. Software runs on a laptop and it is connected to the TETRA network through a standard Radio by means of USB serial cable (PEI AT protocol). hosTESS is installed in the TETRA core infrastructure, all features of the suite are enabled. The hosTESS platform can be installed on any system (it is multi-platform), it will connect to the TETRA Short Data Router (SDR) through TCP/IP protocol. Extended TETRA services will be provided to authorized remote clients. hosTESS suite is installed in standalone mode on a generic laptop that is connected (USB cable) to a standard TETRA Radio. This mode allows to setup a minimal TETRA management station in few minutes, anywhere. 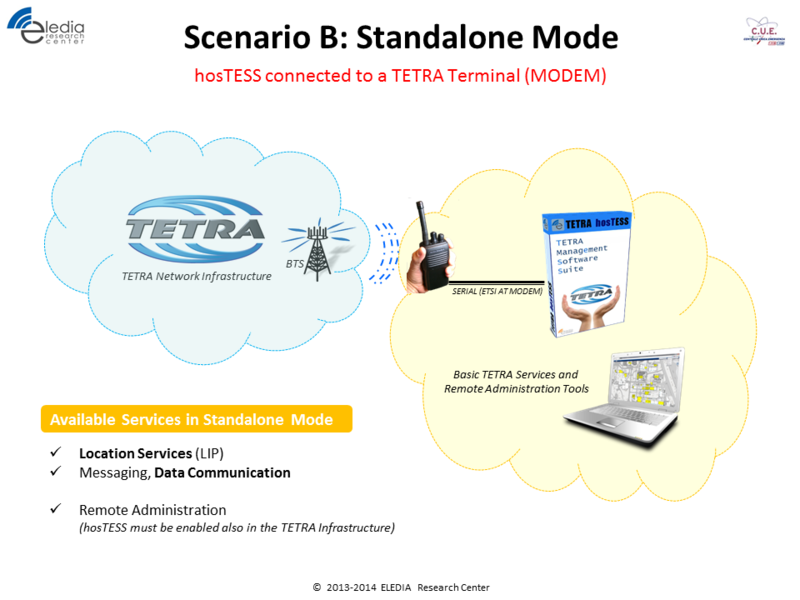 hosTESS interacts with TETRA network as remote client by means of PEI AT Interface (ETSI Standard). supports remote administration and it can proxy services over the network with different levels of privilege through multi-platform client applications provided in the package. Command-line, CLI shell and GUI user interfaces are also supported. supports multi-role, multi-user access control with fine grained policies (i.e. allow specific operations on specific terminals). The security framework is based on Apache Shiro. Interoperability and synchronization with external tools is guaranteed by embedded Web Services (RESTful) and AMQP interfaces. Most common formats are natively supported: CSV, JSON, GeoJSON. designed to cooperate with Emergency and Fleet Management tools, as well as Decision Support Systems.